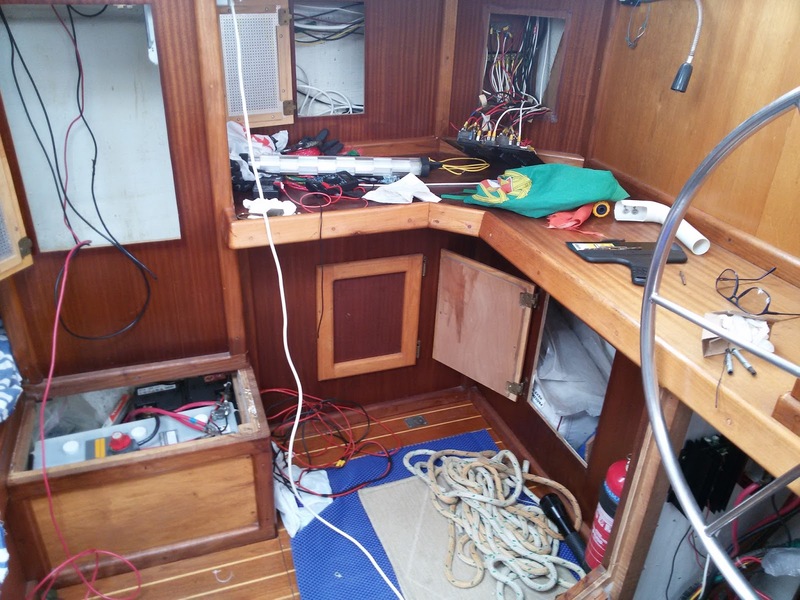 Impressive amount of wiring for a naked boat ;-) IMHO a solar panel is one of the best additions one can add to it's boat if planning to stay of the grid for a while (or being in a harbour where power delivery is inconsistent). On my boat i'm running a 100 watt panel that's basically delivering so much energy that i don't know what to do with it. A small word of warning about the measured voltage: 14,7 volts is rather high, the charging of a lead acid battery is a chemical process driven by voltage, not by amps and at 14.4 volt you reach the point that the electrolyt will start gassing, so keep a close eye on those electrolyt levels. I'm running my charge controller at 14.1 volt and that keeps my batteries healty without any electrolyt losses. 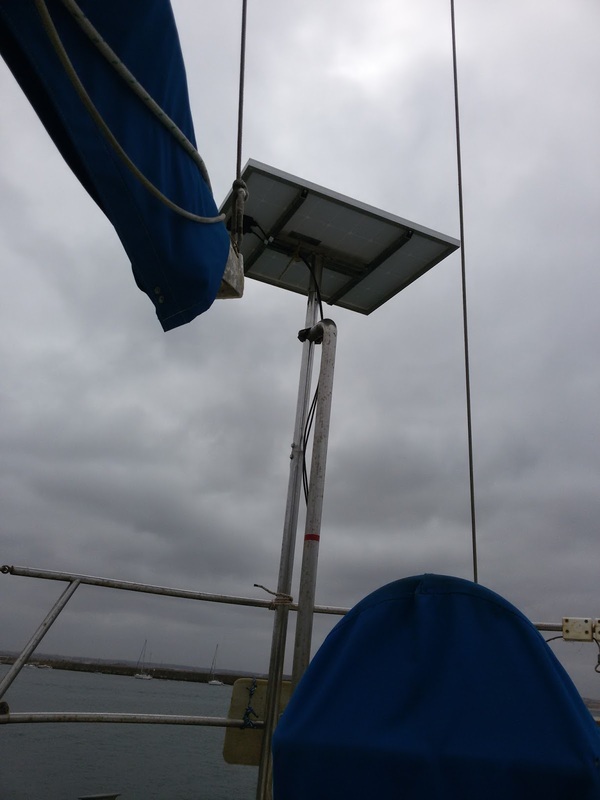 I totally agree, solar panels are great...no moving parts, no humming vibration noise in the boat. I should have shot my wind generator years ago!! My regulator manual says "14.6 volts for flooded batteries". It also says something about occasional higher voltage to equalize the battery. But the regulator manual is on the boat and I'm at home, so I'm not sure. In any case, I went back to the boat yesterday afternoon and the voltage was 14.4 on a fairly sunny day. On the other hand, my digital voltmeter cost 7 euros. Good idea to keep an eye on the electrolyte. By the way, my house battery (the regular type) is about 7 years old. The secret is to keep it charged most of the time, which is easy on a naked boat. Ahh.... see how good it feels! Free energy is a good and wonderful thing. Unfortunately wiring spaghetti on a boat stinks! 14.6V seems a bit much. I think mine are 13.8 and I hardly loose any battery fluid. I'll have to check. But whatever.... enjoy the cold beers and crank up the music! I was at the boat today and read the manual more carefully: 14.6V for the equalizing charge; 14.4V for boost charging; and 13.7V for float charge. So now I can sleep well while the regulator does its thing.